The section dealing with the second system, the Kadampa, consists of three parts—the source texts, the spiritual advice, and the pith instructions. The section on the source texts includes the primary source—The Lamp for the Path to Enlightenment and its commentary—as well as commentaries on the stages on the spiritual path and other instructions. The section on the spiritual advice includes the primary source—The Seven Points of Mind Training—as well as the instruction manual on this theme called The One Hundred Collected Instructions on Mental Training and other texts. The section on the pith instructions includes the source text—The Bodhisattva’s Garland of Gems—as well as the empowerment and instructions for the Sixteen Spheres and the auxiliary authorizations and instructions concerning the Four Deities. From the “new Kadampa” tradition, so named by Jé Rinpoché [Tsongkhapa], I have included his treatise The Three Principal Aspects of the Path, as well as the text Mahamudra: The Main Path of the Victorious Ones, and the definitive instructions. To supplement these teachings, I have included the rituals to confer the bodhisattva vow from both traditions of that ordination. As well, there are some associated texts—instructions on the Madhyamaka view, a ritual to honor the gurus of the Kadampa School, and transmissions connected with Kartaridhara Mahakala (the guardian deity of these teachings) and Lord Atisha’s tradition of White Jambhala." Source: Richard Barron, The Catalog of the Treasury of Precious Instructions, p. xvi. theg pa chen po'i lam gyi rim pa'i gzhung byang chub lam gyi sgron ma - Translated: Many Times by various people, but not by Thupten Jinpa. byang chub lam gyi rim pa'i khrid yig thams cad mkhyen par bgrod pa'i bde lam - Translated: Jinpa, Thubten, trans. Path to Bliss: A Practical Guide to the Stages of Meditation. Ithaca, NY: Snow Lion Publications, 1991. Noble Path of the Bodhisattva, a ritual for the arousal of bodhicitta according to the tradition of extensive conduct in the Mahāyāna approach, authored by Jamyang Khyentse ( 'jam dbyangs mkhyen brtse'i dbang po). jo bo rjes rgyal srid spangs nas thar pa sgrub pa'i rnam par thar pa - Translated: Jinpa, Thupten, trans. "How Atiśa Relinquished His Kingdom and Sought Liberation." In Mind Training: The Great Collection, Volume 1, 27-55. The Library of Tibetan Classics. Boston, MA: Wisdom Publications, 2006.
theg pa chen po'i blo sbyong gi rtsa tshig mchan med - Translated: Jinpa, Thubten, trans. "Root Lines of Mahayana Mind Training." In Mind Training: The Great Collection, Volume 1, 71-73. The Library of Tibetan Classics. Boston, MA: Wisdom Publications, 2006. Text possibly authored by Atīśa 38b3-41a7. Pages 170-175. No title given, see note below. ↑ These are the miracles of enlightened form (such as levitation), speech (teaching in accord with each being’s mental disposition), and mind (revealing the remedies for afflictive states). ↑ The three higher trainings are those of ethical discipline, meditative stability, and sublime intelligence. 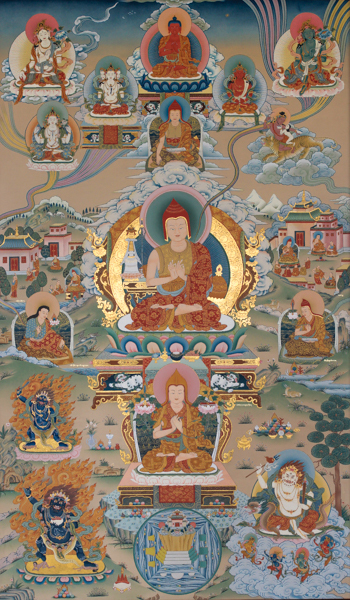 The Three Collections are those of the Vinaya (focusing on the higher training in ethical discipline, which is the remedy for what is to be eliminated), the Sutras (focusing on the higher training in meditative absorption, the remedy that presents what is to be undertaken), and the Abhidharma (focusing on the higher training in sublime intelligence, the remedy that presents what is to be understood). ↑ Barron, The Catalog, Note 141. Theg pa chen po’i lam gyi rim pa’i gzhung byang chub lam gyi sgron ma, vol. 3, pp. 1–8. This text, which is the source for the branch based on primary sources, is combined in volume 3 of The Treasury of Precious Instructions with the two texts that are, respectively, the sources for the branches based on spiritual advice and pith instructions and that are not mentioned at this point in Kongtrul’s catalog: Source Verses for the Seven Points of Mental Training in the Mahāyāna Approach (Theg pa chen po’i gdams ngag blo sbyong don bdun ma’i rtsa ba), which includes an interlinear structural analysis, vol. 3, pp. 8–11; and A Bodhisattva’s Garlands of Gems: Source Verses for the Precious Volumes of the Kadampa Pith Instructions in the Mahāyāna Approach (Theg pa chen po’i man ngag bka’ gdams glegs bam rin po che’i rtsa thig byang chub sems dpa’i nor bu’i ’phreng ba), vol. 3, pp. 11–14. ↑ Barron, The Catalog, Note 143. This text is not contained in the available editions of The Treasury of Precious Instructions. ↑ Barron, The Catalog, Note 148. In his catalog, Kongtrul gives the abbreviated title of this work as Blissful Path to Primordial Unity (Zung ’jug bde lam). ↑ This entry is given in a different order, before Tsonkhapa's first text above in Kongtrul's The Catalog. ↑ In Mind Training: The Great Collection, Thupten Jinpa says "Though this is clearly a commentary on a verse text entitled Leveling Out all Conceptions, in the Lhasa edition of the Tibetan original, interestingly, no title is provided at the beginning of this text." He also states that this commentary appears in Shönu Gyalchok's Compendium of Well-Uttered Insights, pages 216-221. ↑ Although Kongtrul lists this text in his dkar chag, see The Catalog, Note 157: The text for this prayer is not contained in the available editions of The Treasury of Precious Instructions. This page was last edited on 28 January 2019, at 21:44.